I heard about Michael Jackson’s death lying on the bottom bunk in a hostel in Zagreb. I was one year into writing a PhD, and I was in the city for a conference. The previous day I had given a paper on a panel about failure and non-knowledge in contemporary performance. In spite of the subject matter, giving the paper – my first at an academic conference – felt like a step towards joining a community of articulation. This community demanded the making of claims, and this making of claims in turn demanded a kind of conjuring of myself as the sort of subject who could take on this kind of action. It was an undertaking I felt (and still feel) ambivalent about. I gave the paper, responded to questions, listened to the other quite brilliant papers on the panel, and engaged in a group discussion. Then I left the room, went outside and was sick in the carpark. I made it back to the hostel where I was staying and spent the next forty-eight hours being violently ill. I was lucky to be sharing the room with kind and caring friends who helped me rehydrate and found medication for me. It can’t have been pleasant for them. I was finally recovering when one of these friends announced that Michael Jackson had just died. The oddity of the past few days crystallised in that moment. The illness was almost certainly a result of food poisoning, and yet I’ve not been able to uncouple the experience from the directly preceding conference presentation, as if my attempt at self-articulation was inextricably linked with my own physicality and vulnerability. Somehow, the corresponding event of Michael Jackson’s death has made the memory significant, a kind of triangulation where what is located is the force of contingency, a slippery lesson about cause and reaction. Questions about self-determination, self-fashioning and contingency seem to lie at the heart of Beth Emily Richards’ Poor Copy, a series of three works circulating around appearances Michael Jackson made in Devon in the late 90s and early 2000s. As in my anecdote above, Michael Jackson as a figure lends himself to these questions. This is the figure of the exploited African-American child star who was denied the opportunity for self-determination by overwhelmingly dominating outside forces, a figure who became notorious for re-fashioning his own body and who became known as a predator. On the other hand, the difficulty of representing Michael Jackson is that he can seem like a phenomenon, like sleazy weather, as one of the last of the mega-stars, the decline in which is sometimes bemoaned as a casualty of ever narrowing market segments in the age of targeted advertising. This temptation to understand Jackson as natural phenomenon is addressed and dismantled in Mark Fisher’s collection The Resistible Demise of Michael Jackson, whose Brechtian title announces an intention to locate Jackson instead among capitalist social relations. In Poor Copy, Jackson-as-phenomenon is both examined and dislocated through a technique of hyper-specificity. There are two instances that the event – part of a larger body of work by Richards – addresses. First, a Michael Jackson tribute night in Barnstable in 1999 where the impersonator was so convincing, people in the audience to this day insist that it was really Michael Jackson. Second, a documented appearance by Jackson at an Exeter City Football Club match in 2002, where he made a speech at the invitation of Uri Geller, a personal friend and then-joint chairman of the club. This second appearance was apparently so dizzying in its incongruity that its veracity has been questioned even by those who were there. Poor Copy consists of three separate works each of which responds to one of these appearances. The first the viewer encounters is Like a Pantomime, a live work performed by Matthew Reed and Sara Versi. The performers attempt to mimic the moves on an instructional video demonstrating how to do a Michael Jackson dance routine whilst also speaking text gathered by Richards from local sources. These include Uri Geller describing the motivation behind joining the Exeter City board – it involved a series of visions by his son about Devon, reincarnation and witchcraft. In an adjoining gallery, the video work Yes, It Really Happened shows local newspaper coverage of the Exeter appearance, documenting as well the public library-resourced microfiche and the slow physicality of archival research. 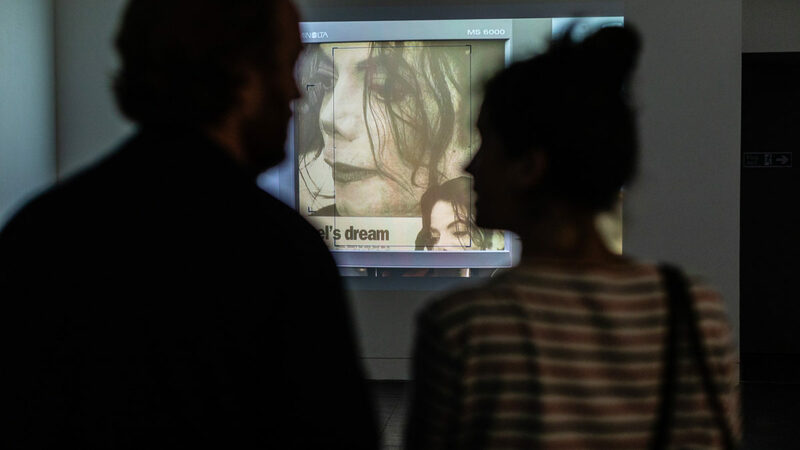 The final gallery shows raremjvideos1, appropriated YouTube videos from Jackson’s Exeter visit shot by his bodyguard Mike Fiddes, the shaky camera movements becoming nauseous in the dark room. Fragments of text, spoken and printed, fill the spaces. Express & Echo (southwest daily paper of the year) –– Uri Geller invite to Jacko –– First it was Michael Jackson then it was David Blaine now Exeter City trying for Madonna –– Yoko Ono planning living art tribute –– Yes it really did happen! –– Jackson: seeing is believing for fans. Pinch yourself, it really did happen –– Jackson on Exeter City board. I ask someone to tell me who Uri Geller is and I hear about bending spoons and the power of orange. The oldest hotel in England –– David Blaine doing card tricks for kids –– Honour Michael! Honour him! He’s doing this for you! –– A lot of weirdos around at that time –– Like a pantomime. The category of the hammy is destabilising. Hammy doesn’t laugh at itself; it doesn’t roll its eyes. Hammy is skilled but never virtuosic – virtuosity is defined by appearing to transcend the body. Heinrich von Kleist famously wrote in the early 19th century about the superiority of the marionette theatre over the human performer; its inhumanity never produces the condition of the hammy. Hammy thinks well of itself but is in proximity to insecurity, or maybe produces insecurity in its performance of itself. The category of the racial. Devon and whiteness. The refrain in the local press about the surreality of Michael Jackson in Devon has something to do with whiteness. Denise Ferreira da Silva reads the production of the category of the Racial alongside the production of the modern subject of the Enlightenment. She reads modern philosophy and the history of science as a narrative about the reasoning subject who is self-determining insofar as they are capable of reason. In this they are distinguished from the products of the rational, regulated universe, i.e. extended, contingent things, the body, that which is affectible. The development of the modern subject is a series of resolutions of the encroaching crisis of affectibility – the possibility that reason (the ability to perceive regulation and to produce representations) might determine that the reasoning subject is subject to reason, i.e. affectible. The resolution of the crisis of affectibility is, over and over, the category of the Racial, which is spatial (global) rather than temporal (historical), and affectible, contingent, subject to engulfment and/or annihilation. Alongside this critique, Da Silva develops the notion of ‘poethics’ to construct the possibility of thinking that doesn’t rely on the engulfment/annihilation of the affectible. The title Poor Copy evokes the idea of degradation away from a source or a centre. The contingent as degraded. It also, though, can be heard as a note of solace, comfort or tenderness.